Easy Access / Quick Cleanup FASI E-Series corrosion free, stainless stell single hopper loader is designed to provide rapid transportation of free-flowing, virgin granules and regrind directly to your injection molding machine. The hinged vacuum head ensures quick cleanup time and easy maintenance. 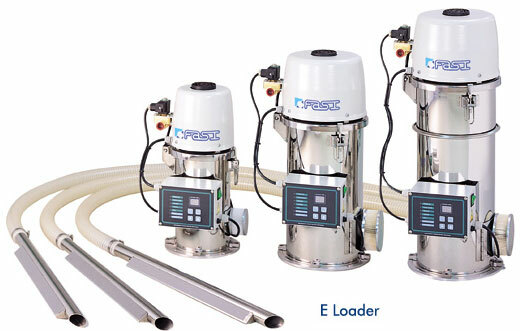 The integral single-phase suction motor creates a flow of air which carries the plastic granules into the hopper through the material line for a pre-selected time. The granules are then discharged directly into the processing machine hopper. This cycle is repeated until both the machine hopper and hopper loader are full. Reliable Performance All units have a microprocessor control for setting and displaying loading time, loading function, and mode slection, digitally. Fault diagnosis is provided as a standard feature of the control. All models are built to the highest standards from quality stainless steel providing consistent, reliable performance. • Fabric suction filter (with s/s mesh). • Low noise suction head. • Mechanical flap (or Electric level sensor). • Easy clean blow-back cartridge filter (E series). • Electronics prepared for centralized system. • Electrical circuit built to comply with CE safety requirements. Options • Self cleaning filter ( Models denoted by 'FC' ). This series is fitted with a plexi-glass material chamber with electric level sensor, also a non-return flap valve on the material discharge port of the hopper bowl.